The name lovebird is a perfect fit because these birds are loyal, affectionate, and they mate for life. Not only are lovebirds wonderfully devoted pets, but they are able to learn a wide range of tricks, and they are very active birds as well. Plus, they come in a wide range of colors which makes them one of the most beautiful pet birds around. Lovebirds make wonderful pets, but they do require a certain degree of care to remain healthy. Keep reading to learn more about lovebird care requirements and how to shop for the best bird cage for lovebirds. How Much Space Do Lovebirds Need? What Else Should You Include in Your Lovebird Cage? The lovebird is a small, stocky parrot that generally grows 5 to 7 inches tall. These birds have large bills and come in a wide variety of colors. They typically live 10 to 12 years in captivity but have been known to live as long as 17 years or more with proper care. As the name suggests, lovebirds are very loving and affectionate birds. They are really named for the fact that they mate for life, however, so these birds tend to do best when kept in pairs, so their needs for attention and affection are met. This means that you’ll need to provide care for two birds instead of one and you’ll need to provide a larger cage than you would for one bird. Because lovebirds are fairly active, they need a significant amount of space so they can spread their wings and work off their excess energy. Keep reading to learn how to choose a bird cage for lovebirds. When housing lovebirds, it is important to remember that they are active birds, so the more space you can provide, the better. This is particularly true if you’re keeping a bonded pair of lovebirds instead of just a single bird. Minimum Cage Size – Each pair of lovebirds needs about 35 cubic feet of space. If you plan to keep more than a pair of lovebirds, make it three pairs instead of two to avoid fights and provide as much space as possible. Width and Height – The minimum dimensions for a lovebird cage should be 32x20x20 inches per pair of birds. You might also consider having a separate flight cage measuring 6’x6’x3’ in size. Bar Spacing – Lovebirds are fairly small birds, so make sure the spacing between the bars is no more than ½ inch, so the bird doesn’t accidentally get its head stuck between the bars. Perches – You’ll need to provide at least two perches in your lovebird cage per bird, at least four if you’re keeping a pair. The perches should be different in size and texture. Keep reading to see our top 5 recommendations for the best bird cages for lovebirds. When it comes to choosing a cage for lovebirds, you’ll most likely be shopping for a cage to accommodate two birds instead of one. 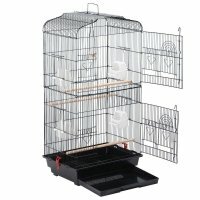 You’ll need to think about factors such as size, dimensions, and materials when shopping for a lovebird cage. If you’re going to invest in a bird cage, you want it to last and this Best Choice Products 68” Durable Bird Cage is definitely a good option. Made from sturdy iron and equipped with rolling wheels to make it portable, this bird cage has it all. This cage features a slide-out metal tray as well as an angled seed guard that funnels waste and dropped seed right into the tray for easy cleaning. Plus, it comes with three locking feeder doors for your convenience as well as two bowls and a perch. If you’re looking for a bird cage that will last you for years to come, try this Prevue Hendryx Pet Products Wrought Iron Select Bird Cage. Made from ultra-durable, powder-coated iron, this cage is heavy, but it is also very heavy-duty. It comes in several sizes as well, so you can choose the one that best suits your lovebird or pair of lovebirds. Plus, with its unique design, it makes cleanup easy and mess-free. Lovebirds are meant to live in pairs, so you’ll need a large cage if you want to keep two together. 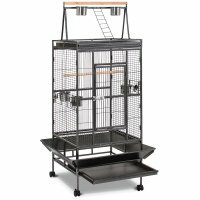 This Prevue Hendryx Pet Products Wrought Iron Flight Cage comes in a large and x-large size so you can choose the right option. It is made from durable wrought-iron to last for years and it features a pull-out tray for easy cleaning. The cage comes with three wooden perches, rolling wheels and a storage shelf under the cage for your convenience as well. Plus, it is priced under $150. 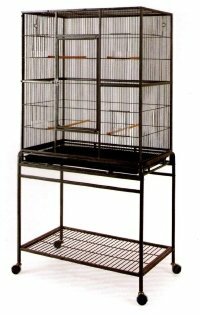 Lovebirds are an active breed, so if you’re looking for a bird cage that can accommodate flight, try this Mcage Large Wrought Iron Flight Cage with Removable Stand. 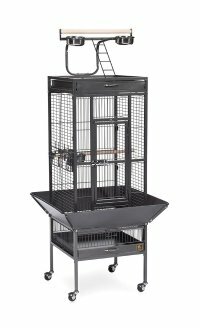 This cage is made from durable wrought-iron to last a lifetime and comes with a slide-out metal tray and removable wheeled stand. It measures 32x18x64 inches, offering plenty of space for your lovebirds, and it is affordably priced as well. Plus, it comes with several wooden perches as well as metal shelves and ladders for enrichment. If you’re looking for a portable cage for your lovebird or a backup cage to keep your bird in while cleaning his daily cage, this Yaheetech 36” Portable Hanging Medium Size Bird Cage is a good option. It is lightweight and easy to carry and comes equipped with several perches and feeding dishes. It is affordably priced under $50 and is solidly constructed from metal wire. When it comes to space, lovebirds need a lot because they are very active, and they are best kept in pairs or groups. Your lovebird cage should provide at least 35 cubic feet of space per pair, or a minimum of 32x20x20 inches. As always, the larger the cage the better. In addition to providing ample space for flight and exercise, make sure to provide at least two perches per lovebird – that means four perches for a pair. You’ll also want to provide food and water dishes and a nest box placed high up in the cage. Provide a variety of toys as well for enrichment purposes. 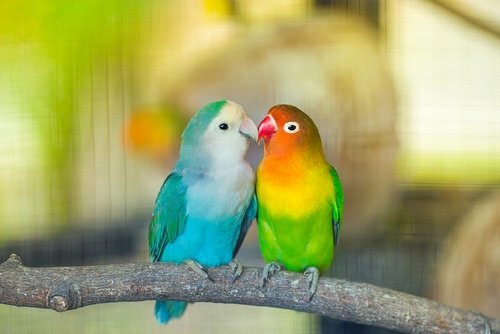 Lovebirds may not be the biggest birds, but they are very active, and they are best kept in pairs which influences your decision in choosing a bird cage. It’s always best to buy the largest cage you can afford, but make sure it meets at least the bird’s minimum size requirements. If you’re not sure where to start shopping for a lovebird cage, try one of our top 5 picks reviewed above!